Nan Jeanne Aspinwall was born in New York, February 2, 1880, though she spent her formative years in Nebraska. 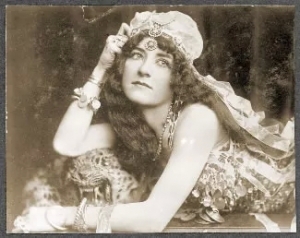 By 1899 she was performing as an ‘Oriental dancer’ under the name Princess Omene. In the next ten years, she created a new persona, under the names Montana Girl and Two Gun Nan, and became an expert in trick roping, sharp shooting, archery, stunt riding, and bronco riding. She married Frank Gable in 1910 and the two performed together in Buffalo Bill’s Wild West and Pawnee Bill’s Far East Troupe. She eventually became the highest paid troupe member. Nan really came to prominence, though, when she accepted a bet from Buffalo Bill. 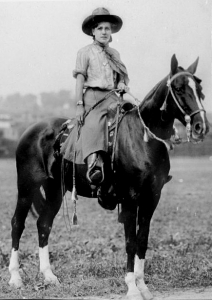 She saddled up her Thoroughbred mare, Lady Ellen in September 1910 in San Francisco and set her course east. She covered 4,496 miles in 180 days, arriving in New York City July 8, 1911. Legend has it that upon entering the city she rode Lady Ellen into a twelve-story building, into the elevator and up to the top floor. 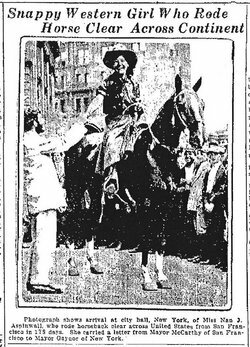 The New York Times reported on July 9, 1911 that “a travel-stained woman attired in a red shirt and divided skirt and seated on a bay horse drew a crowd to City Hall yesterday afternoon.” Nan presented a letter to New York Mayor Gaynor that she had carried cross-country from San Francisco Mayor McCarthy. Frank Gable died in 1929 and Nan remarried Al Lambell, living out her days in quiet domesticity. 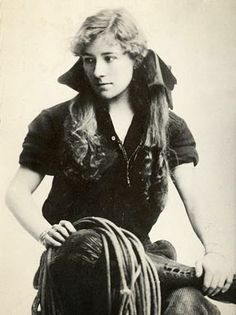 Nan Jeanne Aspinwall Gable Lambell was the first woman to cross the country, solo on horseback and her story became part of the fabric of the romantic consciousness of the American West.